Increasingly applications require the storage and retrieval of spatio-temporal information in a database management system. A type of such information is mobile objects, i.e., objects whose location changes continuously with time. Various techniques have been proposed to address problems of incorporating such objects in databases. 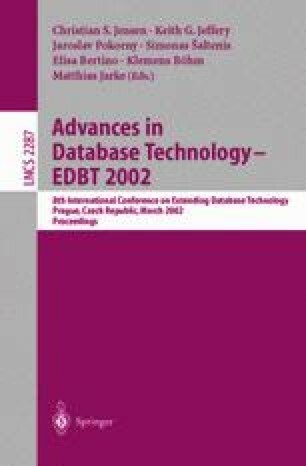 In this paper, we introduce new query processing techniques for dynamic queries over mobile objects, i.e., queries that are themselves continuously changing with time. Dynamic queries are natural in situational awareness systems when an observer is navigating through space. All objects visible by the observer must be retrieved and presented to her at very high rates, to ensure a high-quality visualization. We show how our proposed techniques offer a great performance improvement over a traditional approach of multiple instantaneous queries. This work was supported in part by the National Science Foundation under Grant No. IIS-0086124, in part by the Army Research Laboratory under Cooperative Agreements No. DAAL-01-96-2-0003 and No. DAAD-19-00-1-0188, and in part by Air Force Grant F33615-01-C-1902. We thank the anonymous reviewers for their detailed and helpful comments.